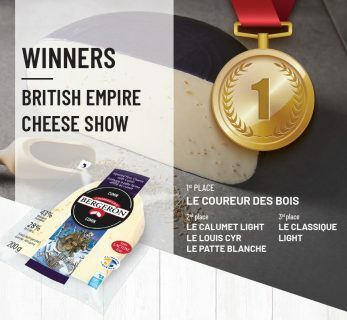 On top of its first prize triumph in the flavoured cheese category, Le Coureur des Bois also won the Reserve Champion Trophy, awarded to the second best specialty cheese across all categories. Le Calumet Light and Le Classique Light also took 2nd and 3rd prize in the new light cheese category. Le Louis Cyr and Le Patte blanche walked away with silver medals in their respective divisions. These honours once again demonstrate Fromagerie Bergeron’s ability to produce cheeses of excellence across a range of delicious varieties.